… and one minor thing … it’s “pore all over the data”, or “pore over all the data”, but not, I think, “pour”. Scrutiny is not a liquid. @grlcowan: Well you learn something new every day. It is indeed pore, meaning to examine closely. And there was me thinking that we were indeed pouring our scrutiny over stuff. Thanks for this talk, Steve! There were so many great things about it. You helped make a process that seems in the realm of these highly intelligent experts feel more tangible to me, and you highlight the challenges of modeling in very clear language and illustrations. 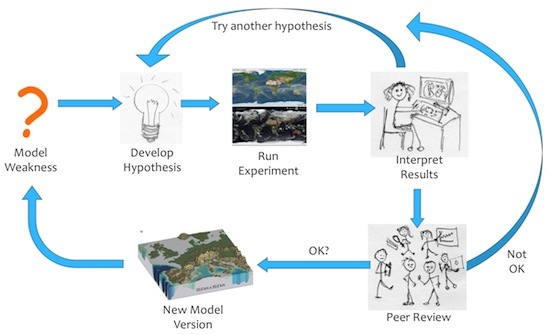 I liked that you were able to touch upon such a broad range of topics in your ultimate question of whether climate models, building up some background domain knowledge just enough so a reader could understand the foundational pieces before getting to your question. 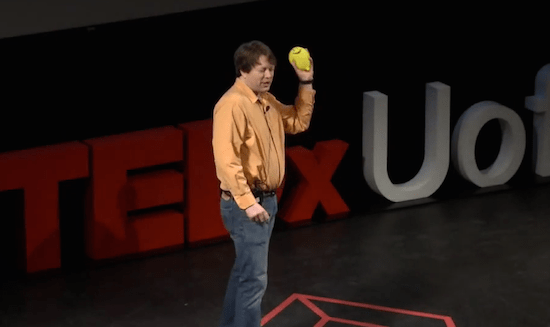 – what these models actually aim to do – help us understand what could happen. 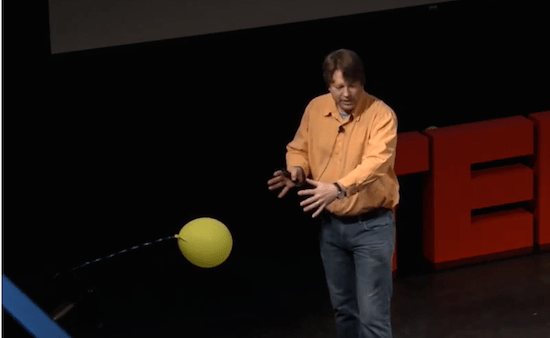 I love the tethered balloon metaphor Steve -I hope you don’t mind educators borrowing it from you? 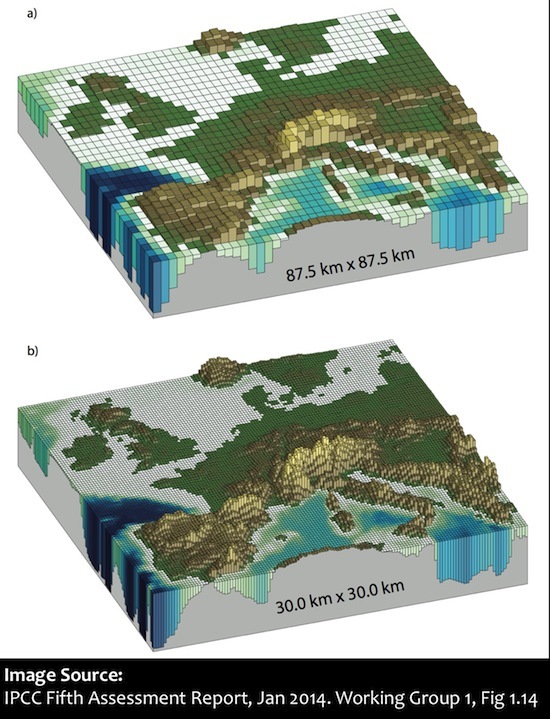 I have a question regarding the modelling of surface, compared with ocean, temperatures -is there a version of a GCM which models all energy uptake as a standard unit? And is there a convention of measurement which would allow such a model to be compared with observations? They use air capture, and it can be implemented anywhere. I don’t think this technology is very cheap to run. BTW I removed the rest of your comment, as it violates my moderation policy. From your tone, I suspect you’re not interested in the answer to your question, but others might be, so thanks for asking! How do you know that’s a reasonable assessment? For example, if I said that world coal consumption is likely to be lower than what it was in the year 2000 in the year 2100, how would you know that was wrong, and that the value in 2100 was more likely to be approximately 10 times higher than in 2000, as the IPCC RCP8.5 scenario indicates? @Mark: Nobody knows that. That’s the point. I said these are “what-if” experiments. IF we follow that path, and keep increasing use of fossil fuels over the coming century, the models tell us how the climate system will respond. As I said at the end of the talk, we have a choice over which path we should follow. @Steve: I’m getting the impression that you’re not interested in serious discussion of whether or not the IPCC’s RCP8.5 scenario is a realistic representation of what is likely to happen in the 21st century and beyond in a “do nothing” or “business as usual” scenario. @Mark: alternatively, it might be just that I have better things to do with my time than play whack-a-mole with tired old denialist talking points. The blog post you link to is just silly. The paper is a critique of the old SRES scenarios, not the new RCPs. Remember that RCP8.5 represents the upper 95% confidence interval on likely BAU scenarios. It’s plausible, but only just. RCP6.0 represents the lower 95% confidence interval. So the likely “no policy” future is somewhere between them. I suggest you read up carefully on how these pathways were created and reviewed before you try knocking them down. This stuff is really not hard to check for yourself. Don’t take the crap at Curry’s blog at face value. Unless you have something really substantial to add, I suggest we devote our time to more useful questions. One more thought (maybe Mark’s talking points are useful after all). It’s very tempting to believe that fossil fuels running out might save us from climate change, even though the numbers say otherwise. But it doesn’t really matter anyway, because the solution is the same in both cases: aggressive global policies to get us off fossil fuels as fast as possible. Waiting till we pass peak coal to do anything about replacing it will be a disaster for the economy. It will also be a disaster for the climate. So which ever line of argument you prefer, a global strategy to phase out fossil fuel use is essential. Nice talk. I have a comment. When you describe ensemble averaging you write: “What happens is that the weaknesses in any one model are compensated for by other models that don’t have those weaknesses.” There is certainly some truth in this, but I am not so confident that this would work for structural model errors, i.e. errors in the science. All models may be missing something in their science, something we don’t know. (Although we do not know what it is, I like to think of some defect in the description of clouds and radiation, or some essential processes in soil biology, or some slow variations in the deep ocean circulation, or whatever.) Remember it is not just basic physics, but an awful lot of parametrisations and then also the biogeochemistry that matter. So it is conceivable, that all current models miss something, and this might introduce a bias. Do you agree? Another point: someone has to decide which models one should retain for the ensemble averaging, and which models should be excluded because they are not good enough. It is my experience that different scientists make different choices in such a situation, and this will affect the ensemble mean. What’s your view on this? I see my comments of June 25th are still “awaiting moderation.” They seem pretty moderate to me. 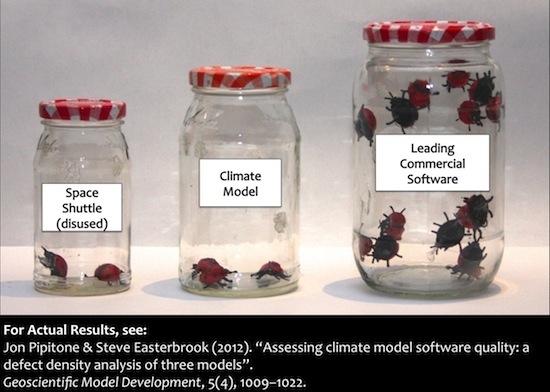 Gerbrand: You’re quite correct – the ensemble approach doesn’t work if there are structural errors in the model. There’s some evidence that the models aren’t as independent from one another as they ought to be (e.g. see the work by Knutti on this: http://pubs.amstat.org/doi/abs/10.1198/016214507000001265). However, I do find it remarkable that the multi-model ensemble works as well as it does for simulating both 20th Century and pre-industrial climates. Harold: My summary is correct. Look closely at the figure. The zero on the Y-axis is the average global temperature for the last quarter of the 20th Century, a point at which some warming had already occurred. So to get the increase over pre-industrial temperatures, you have to add about 1°C. 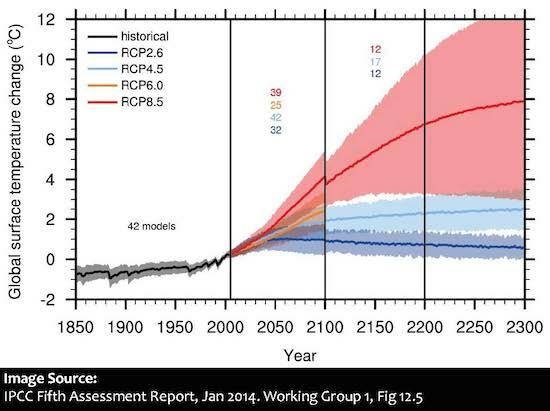 So 5-6°C is a reasonable summary of the spread of model projections for the end of this century, with further rises over the following centuries. BTW this type of nitpicking is particularly pointless. The model spread is big enough so that if you pick a particular model as “the best”, by whatever criteria, you can get an answer anywhere from +4°C to +7°C by the end of this century. Nobody can say for sure what the difference between these two results would mean for humanity, but we know for sure that any of these scenarios would result in a very different planet from the one human civilization evolved on. Over the entire history of human civilization, the global average temperature has not changed my more than 1°C. We’re taking an incredible and unprecedented risk with our planetary life-support system. c) Have something new and interesting to say. Steve: Before I retired I worked for many years developing complex, multi-physics non-linear codes. During that time (when I had the time -rarely), I would spend some time stressing the code. For example, it is easy to use a debugger to perturb a particular quantity and then observe how it compares to unperturbed results. In this way, we could get a handle on the propagation of roundoff error. Doing this we were quite disturbed to discover that the mere placement of parentheses could have in some cases dramatic effects. We would also examine the sensitivity to initial conditions. We expect the code results to be chaotic in some variables. One would hope that some integrated variables were less so. I suspect that such analyses have improved a good deal since I retired, but I’m wondering whether climate codes customarily go through these kinds of exercises.